It’s not too late for planting lilies in pots (although you may have already done this in autumn). 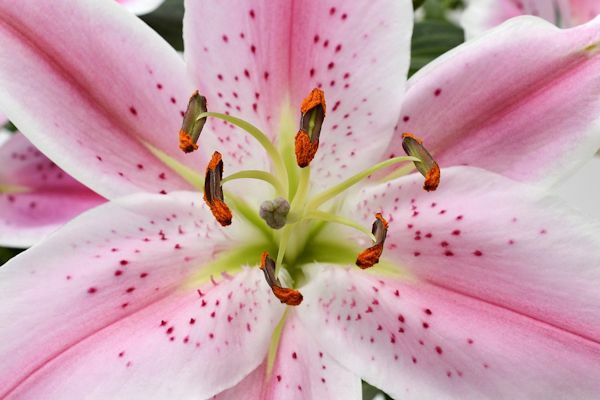 Many lily varieties are suitable such as the ever popular and richly fragranced Lilium regale, ‘Stargazer’ or the pollen-free but scented bloom types like ‘Polar Star’ or ‘Broken Heart’. Choose a large, deep pot at least 25cm (10in) in diameter for three to four bulbs and make sure there is a layer of drainage at the base, for example crocks or gravel. Use a mixture of 60 percent loam-based potting mix (John Innes No 3) with about 20 percent added horticultural grit to improve drainage, plus 20 percent leaf mould or ericaceous peat free compost. Incorporate controlled-release fertiliser granules in the mixture to ensure plants are fed through the growing season. Bulbs should be planted with the pointed tip facing upwards and the basal plate with hairy roots dangling down. Plant stem rooting lily bulbs – those that root from the base and also the stem just above the base (Lilium longiflorum for instance) at a depth of 2-3 times the bulb height, and those that are basal rooting lilies such as the Asiatic hybrids for example Lilium maculatum, (although they are not normally scented) at a depth the same as the height of the bulb. Position in sun or part shade and water regularly. Taller plants may need staking. NB lilies are potentially harmful to cats: see RSPCA website: www.rspca.org.uk or the feline advisory bureau: https://icatcare.org You can find a range of bulbs online or in store right now.